Pope Benedict XVI’s resignation on Thursday – the first by a Pope for more than 600 years – is forcing the Vatican to consider some unusual questions. Here are 10 answers. 1. Name and title He will be known as Pope emeritus, or Roman pontiff emeritus, the Vatican announced on Tuesday. He will also continue to be known by his papal title of Benedict XVI, rather than reverting to Joseph Ratzinger, and he will continue to be addressed as “Your Holiness” Benedict XVI – in the same way, for example, as US presidents continue to be referred to as “president” after leaving office. “Emeritus” is a Latin word meaning “retired”, from the verb “emereri” – to earn one’s discharge by service. 2. 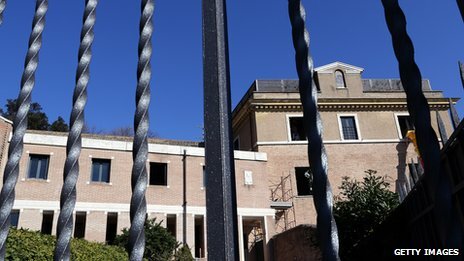 New home Benedict XVI will leave the Vatican by helicopter before he resigns at 20:00 (19:00 GMT) on Thursday, but he will return in about three months to a new residence – a former convent known as Mater Ecclesiae – in the south-west corner of Vatican City. Reports suggest Vatican gardeners will continue to cultivate a 500 sq m organic fruit and vegetable garden there – the Pope is said to enjoy marmalade made from its oranges. Meanwhile – as Mater Ecclesiae is refurbished – he will stay in the papal residence at Castel Gandolfo, south of Rome. 3. His clothing The Pope emeritus will continue to wear papal white – rather than the black of an ordinary priest, or the red of a cardinal. 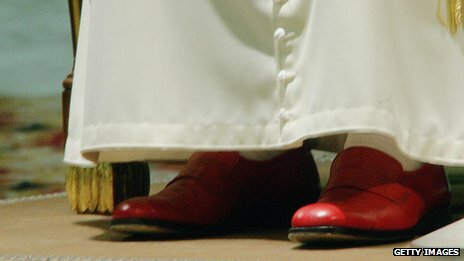 However it will be a simple cassock, with none of the flamboyant hats and vestments he revived during his papacy (prompting the Wall Street Journal to ask “Does the Pope Wear Prada?”) He will be giving up his trademark red shoes, wearing instead brown shoes handmade for him by Mexican craftsmen during a visit to the country last year. 4. His ring The papal gold ring, known as the fisherman’s ring, will be smashed with a specially designed silver hammer when the Pope leaves office. No change here from normal practice. “Objects strictly tied to the ministry of St Peter must be destroyed,” the Vatican says. His personal seal will also be defaced. 5. 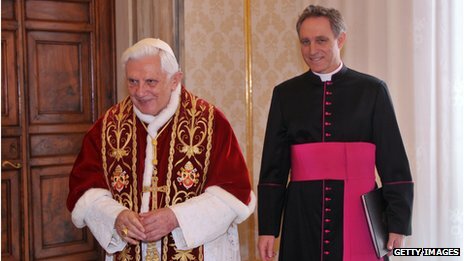 His duties Benedict XVI will have no further administrative or official duties. He will not participate in the conclave to elect his successor (nor will any cardinal over the age of 80), though, since he appointed 67 of the 115 men who will take part in the conclave, his influence will be felt. Senior Catholics have also been re-reading speeches made by Benedict XVI before of his retirement for any hints about the qualities he believes his successor will require. 6. 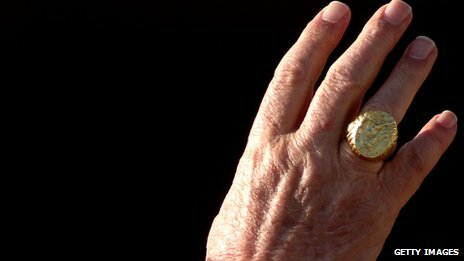 Life in retirement Announcing his resignation, the Pope said he would spend his time praying for the Church. His elder brother, Monsignor Georg Ratzinger, has also said Benedict would be happy to advise his successor, if required. Writing and studying also seems likely to be on the agenda – Benedict had a library of 20,000 books installed in the papal apartments when he was elected in 2005. He also enjoys playing the piano and watching old black-and-white comedies – and he loves cats. At least one, Contessina, is known to live at Mater Ecclesiae. 7. Social media The Pope’s Twitter accounts (@Pontifex and its eight different language versions) will go into hibernation when Benedict XVI steps down. 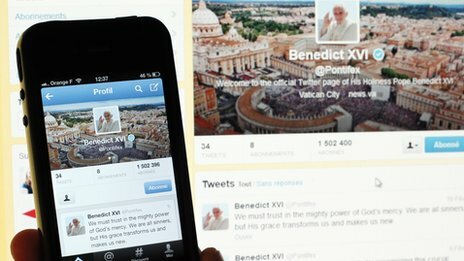 He is expected to utter his final tweets along with his final general audience on Wednesday and before he departs the Vatican on Thursday – saying goodbye to the 2.5 million followers he has gained since opening his account late last year. 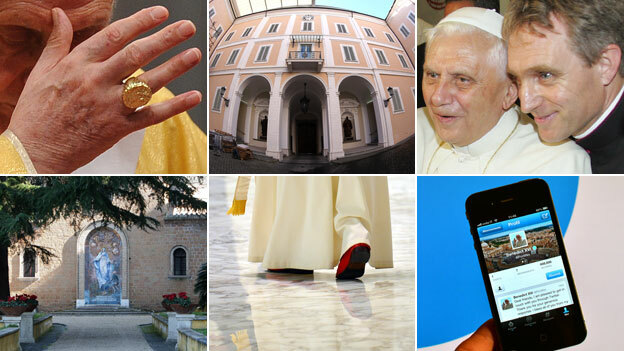 Whether he will take the papal iPad on the helicopter is an open question. During the “interregnum” – the period between two popes – Vatican updates will be distributed from the Secretariat of State’s account @TerzaLoggia. 8. Golden parachute Modest as Benedict XVI’s retirement plans may be, as a bishop he will retain the Vatican’s generous private healthcare policy and is likely to have recourse to the doctors who currently manage his medical treatment. It’s possible he will continue to be cared for by the small group of German nuns who have looked after him during his papacy. As a pope has not retired for 600 years, there’s no precedent for a papal pension plan, but Canon law requires each diocese to look after the welfare of retiring clerics. Rome will doubtless take good care of its Pope emeritus. 9. Georg Ganswein Benedict XVI’s personal secretary, Archbishop Georg Ganswein – the photogenic face seen in the background of a million photographs – will stay in this post. However, he will also keep up his role as head of the papal household for Benedict’s successor. He will be the servant of two masters. 10. Infallibility It’s a widely held misconception the Pope is infallible in everything he says and does. In fact, the First Vatican Council of 1870 ruled a Pope’s rulings are infallible only when they are made “ex-cathedra” – as part of a doctrinal statement about the Church. Benedict XVI never invoked this privilege (and in fact only one infallible statement has been made since 1870). When he resigns as Pope he will no longer be able to make ex-cathedra statements. Is’t true that Poep Benedict xvi convert to Islam? Can you prove that you are a nun who heard this conversation? Because I recently heard this is the very reason the pope has “quit” because he has converted to Islam after reading the oldest version of The Bible recently found in Turkey that’s written in Aramaic and Jesus saying another prophet will come who’s name is Ahmed-Ahmed has the same meaning as Mohammed (saw) and The Quran states that Jesus (as) said another prophet will come after me who’s name will be Ahmed, the name Ahmed has been removed in all other Bibles but in John 14:15 Jesus (as) says when I am gone another prophet will come after me.. The world can not see HIM because the world does not know HIM but you will know HIM… Christians say Jesus (as) is talking about the holy spirit but he (as) was obviously talking about a man/prophet, who had not yet arrived, go to YouTube and type Jesus says Allah and watch that 2minit clip from the passion of the Christ where Jesus (as) says this. Islam is the religion of Adam and Eve, who by the way are burried in Saudi Arabia, Eve is burried in Jedda and Adam in Mecca. Mecca is the town of Prophet Abraham (as) there is so much truth that needs to come out and if you learn you will realize why Islam is the worlds fastest growing region, stop being amongst the lost sheep and seek truth not fiction. If u can’t read the bible and understand it, u better close it n go watch tv rather than read meanings that are out of context. John 14 : 15 – 18. Jesus said in verse 18 ” i willl not leave you as orphans ; i am coming to you”. If mohammed is the promised comforter, then he cant be Jesus. Because if Jesus said i am coming to you, gramatically, it shows there is a concord better jesus n the promised comforter. An analogy can be be drawn between them. But if muhammed is the promised counsellor, he and jesus dont share the same ministry and values.verse 17 says the world wont recieve him because they dont see him, that means he is invisible, but is muhammed invisible n isnt he accepted by millions of people ?, but how many of the world popullation accept the holyspirit ? Instead they critisize him n his personality in the trinity. The book of revelation says any one who adds to these gospel, more will be added to his purnishement. Please dont be decieved , look to JESUS and live. HE IS COMING SOON !!! The prophets convey the commandments of God Almighty to his followers and members of his community. The Prophet shows the righteous path to the members of his community and make them aware and accountable before God Almighty, what good they perform will get its benefits in the life afterwards and punishment for all their sins/misdeeds on the day of judgement. The Muslims have a firm belief that the Prophet (ISSA) Jesus (May Peace be Upon him) will descend from Haven and will rule the world for 40 years under the commandments of Holy Quran, which God Almighty revealed on to the Prophet Muhammad (May Peace be Upon him) and thereafter there will be end to temporal life and followed by day of judgement . I , wonder ! !!! How the Christians of that coming days will follow the prophet “Jesus May Peace be Upon Him” holding /following the commandments of the Holy Quran. Muhammad is a Jalali name having reference to being forceful and powerful. It means, some one who is praised by Allah. 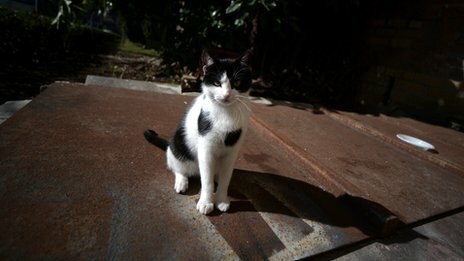 Ahmad is a Jamali name, indicating, having love, peace and beauty. It means some one who loves Allah maximum. The prophet s.a.w.s. real name was Muhammad. Ahmad was an additional name for him. His name Ahmad was a sign for him being loving and peaceful like Jesus a.s. That was his conduct in Makkah for 13 years when he suffered but did not retaliate. The name Muhammad was a sign for him being powerful full of glory, like Musa a.s. The prophet Muhammad has been described with both roles mentioned above, I.e. being like Jesus and being like Musa a.s. In Quran, it is stated, “We have sent to you a messenger the like of the one who was sent to Pharaoh.” So, the prophet Muhammad s.a.w.s. is the like of Moses a.s.
Jesus a.s. can never come in this world again because he has definitely passed away like all other messengers. Jesus was a messenger for the children of Israel. Quran has stated the above facts. It is useless to wait for the coming of Jesus a.s.